SUP Fitness Training: Got Stoke? Why do we do all of those push ups? Why do we push, pull and lunge through TRX workouts and hit the gym for strength, endurance and flexibility between sessions on the water? Is it to look like Candice Appleby, on the left, as she hits the surf for some weekend waves and fun? 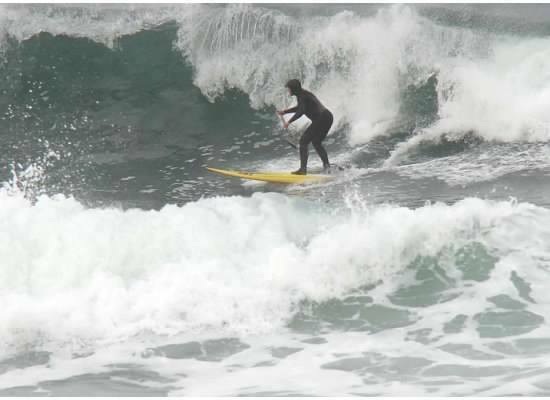 Fun wave, new Naish Hokua, cold water, Pacific City, Oregon stoke. First wave in my 66th year. Whatever “those days” mean to you, be sure to reflect on them when they happen. Imprint a mental image and savor the moment. When you hit the gym and notice your abs are missing their 6-pack or the scale registers 10 lbs too many, go back to the real reason you are training. What’s YOUR stoke? This entry was posted in Pacific Northwest, People, SUP Fitness and tagged Candice Appleby, chuck patterson, elder sup, Huntington Beach Pro by Water Words. Bookmark the permalink.